They're Here! Just in Time for Summer...Bangle Bracelets! How are you today? 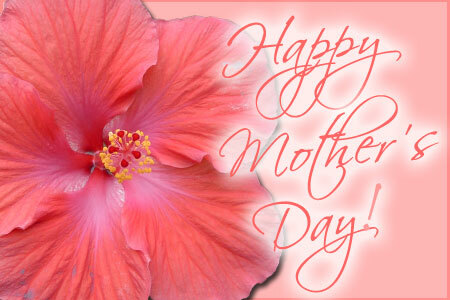 Hope everyone's having a great day and getting ready to welcome in summer (my northern hemisphere friends anyway)! 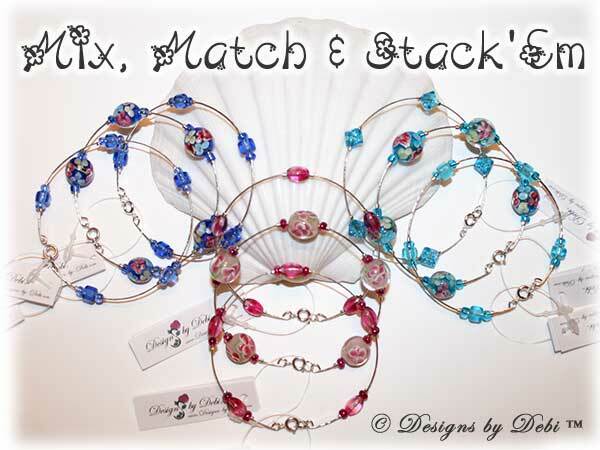 Just in time for summer I'm unveiling my Bangle Bracelets!! 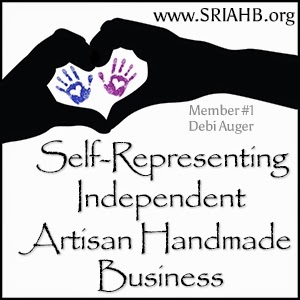 They're this season's must-have accessory and you can find all the best ones at Designs by Debi. If you like bangle bracelets, you're going to LOVE these! 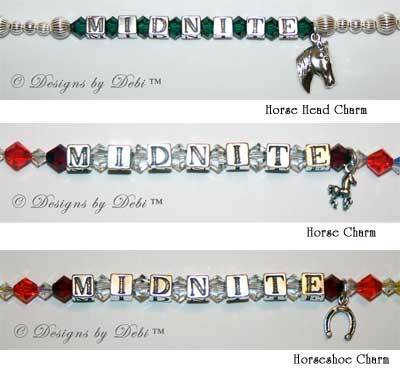 For those of you who don't already know, bangle bracelets are actually how Designs by Debi came to be in the first place. I wanted beaded bangles and couldn't find any so I decided to figure out how to make them myself. 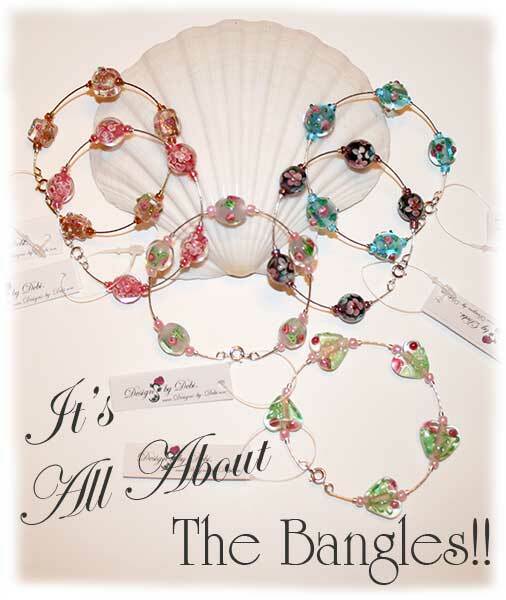 You can read more about it and the bracelets in the new article I wrote called "It's All About the Bangles!" in the reference center on the website. While I'm finishing up the photo-editing and getting them listed though, you can go on over to the 313 Fan Giveaway tabs and enter to win one! Read, agree to and follow everything on the Rules tab first then hop over to the Prizes tab and follow the instructions to enter. There will be 5 winners chosen and each will receive 1 bangle selected from the ones on the prizes page. The giveaway is open until June 14th so go on and enter and please share it with your friends! 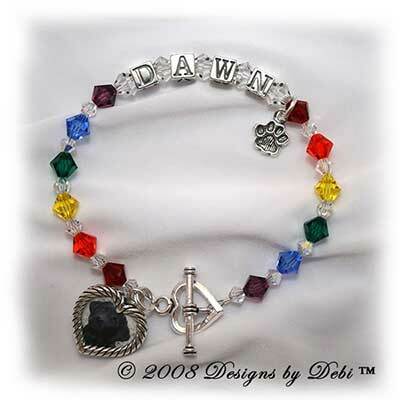 Dawn was my grandfather's Seeing Eye Dog. She was wonderful and, since I would never put Niko's name on the sample for fear of jinxing myself, I decided to honor Dawn instead. 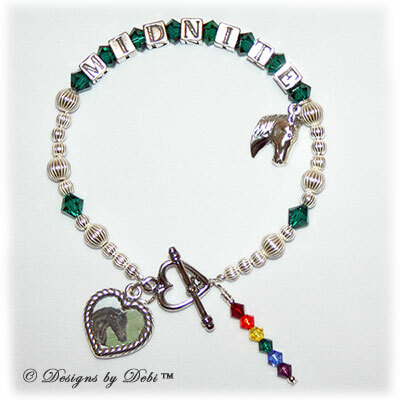 Custom orders are my specialty and, with the vast selection of charms available, these bracelets can actually be customized for any kind of pet. To many of us pets are family. They bring great joy into our lives and when we lose a pet it hurts...often just as much as losing a human friend or family member. 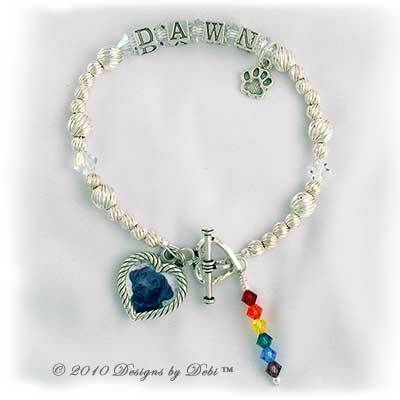 The Pet Memorial Bracelet is a great way to carry your love for your pet and happy memories of them with you every day to bring you comfort. If you or someone you know ever suffer that terrible loss and are looking for a special keepsake, I'd love to design one for you. Well, I think I've FINALLY worked out all the bugs in the sign-up process for my newsletter! (It's a double opt-in system to avoid spamming.) And once I accomplished that feat today, I started putting together the first issue. I'm so excited! And ((*hint*)) you're not going to want to miss the first issue so, if you haven't already, head on over to the main part of the website to sign-up. There's a sign-up box in the right column of every page on the site. The first issue will arrive in inboxes first thing Sunday morning so make sure you get on that list!